Escheat reporting, also known as unclaimed property reporting, is a mandatory process that all companies are required to perform each year. Companies must complete and file annual reports that identify dormant or abandoned properties and remit those properties to the state. If you’ve been charged with the responsibility of escheatment reporting, you know the process is anything but simple. With 55 domestic reporting jurisdictions – and little uniformity from one to the next – it can be a daunting task for companies to handle their unclaimed property reporting processes in-house. For example, some jurisdictions require reports in the fall – others want them in the spring. Dormancy periods vary by property type and which jurisdiction you’re reporting to. Furthermore, unclaimed property laws are constantly changing. Keane’s escheat reporting service is a cost-effective means of ensuring compliance and reporting unclaimed property accurately year after year. If you would like additional information on the escheat reporting process and the basics of unclaimed property reporting, Keane has prepared a brief 20-minute webinar presentation that is available to view for free here on our website. We invite you to view the webinar if you are unfamiliar with the process, or just need a refresher course. Many organizations realize the tremendous value in outsourcing their annual unclaimed property and escheat reporting work to Keane – and yours can too. Our team of highly qualified specialists will help you successfully navigate the path to compliance with each jurisdiction to which you must submit a report. Reporting unclaimed property can be a complex procedure. With Keane, the reporting process doesn’t have to be. Keane’s escheat services specialists will manage the reporting process to all applicable jurisdictions. Our escheat compliance solutions will enable your organization to conduct compliant and accurate required mailings and file reports on time, each and every time. For each escheat reporting cycle a dedicated reporting coordinator will manage the entire process, beginning with a preliminary analysis of your potential unclaimed property liability. Backed by our team of experienced consultants – attorneys and certified public accountants with decades of experience on both sides of state audits – we will work to identify any allowable abandoned property exemptions to reduce your liability and enhance your cost savings. Keane staff will then process all state required due-diligence mailings and determine the final scope of your unclaimed property reports. Final reports are then generated and submitted to the respective states based on their individual requirements and expectations. At the conclusion of the process, our specialists prepare a filing position which contains a detailed report outlining current and future escheat reporting obligations – including any amounts that are past due – and a suggested strategy for addressing future compliance. Your reporting coordinator will answer any questions you may have throughout the cycle and keep you involved through every step in the process.  The annual unclaimed property reporting process can be difficult, cumbersome, and time-consuming – but it doesn’t have to be. By partnering with Keane for annual escheat reporting and escheatment services your organization will be more empowered to address unclaimed property laws and regulations efficiently and effectively knowing that you’re backed by the undisputed leaders in the unclaimed property industry. Ensure your annual unclaimed property reports are filed accurately, avoiding costly unclaimed property audits. Tap into the people, processes, and technology we have assembled to manage annual escheat compliance reporting – including issuance of checks to states and property owners. Receive an accurate data analysis to ensure you do not over-report your obligations. Leverage our extensive system of quality controls. Free your internal resources for other activities that are more strategic to your business. Ready For Help With Escheatment Reporting? If you still have questions or are interested in partnering with Keane for your compliance needs, please contact us for additional information.